The Oceanis 38’s interior is unlike any boat I’ve stepped on before. In the Daysailer and Weekender versions, the forward bulkhead has been replaced by a structural frame, leaving the large forward berth open to the saloon. The feeling is that of a much larger boat and worth the effort to make up a bunk in the name of tidiness. 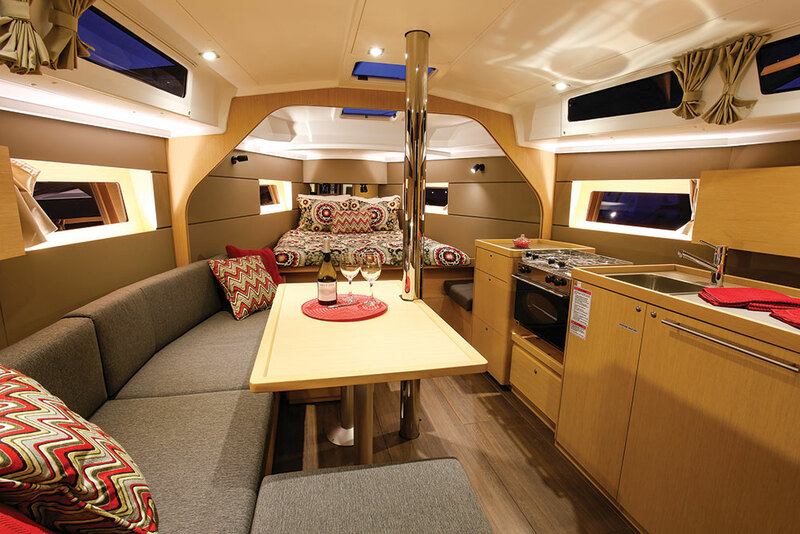 Five people will sit comfortably at the table (not included in the Daysailer layout) and six could squeeze in, especially if one of the ottomans (attached to the floor for safety underway) is moved to the opposite side of the table for a little more elbow room. The table also drops down to become another bunk. The bulkhead can be added back in for the Cruiser layout, creating a more traditional interior and more privacy in the forward cabin. The interior, including the floors, is finished in Alpi Wood, a sustainable product made of reconstituted wood from eco-responsible sources, adding to the light and airy loftlike feel. To starboard is a galley kitted out with everything a sailor could want on a boat of this size. A microwave, good-sized sink, two-burner stove and oven along with a front-opening refrigerator are all easy to access, although the open galley may be difficult to use underway in rough conditions. A large portlight even affords an excellent view for the cook. It’s refreshing to see that a true nav station, aft-facing at the end of the port-side settee, is standard in all layouts. The nav desk is large enough for a folded chart, not just a laptop. In all versions, the head is aft to starboard. There are probably more opportunities to customize the Oceanis 38 than on most production boats over 50 feet. 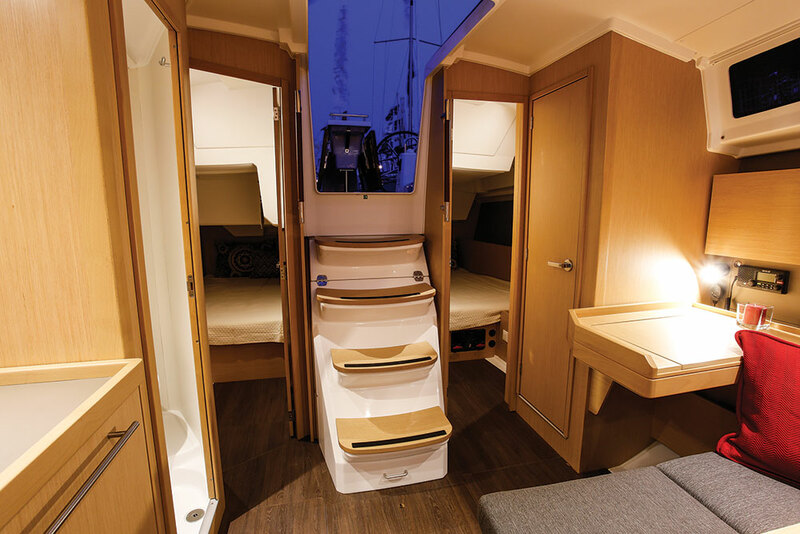 Two- or three-cabin layouts are available in the weekender and cruiser versions and owners can choose a separate shower stall, helmsman seats, galley design and more. The designs also give owners flexibility to modify some aspects of the layout as their needs change. Storage is not as obvious as in a more traditional design. There are no lockers forward, just a drawer under the bunk for quick storage. However, the berth easily lifts up to expose cavernous storage underneath the bunk. Beneteau worked with luggage manufacturer Longchamp to create a “rolling locker” that can be hung from built-in hooks at the end of the forward bunk. The idea is that you pack your bags at home, roll them down the dock and hang them up when you get to the boat. It’s a concept that is probably well suited to true weekender sailing. Other storage is cleverly tucked under settees, in ottomans and in the galley.